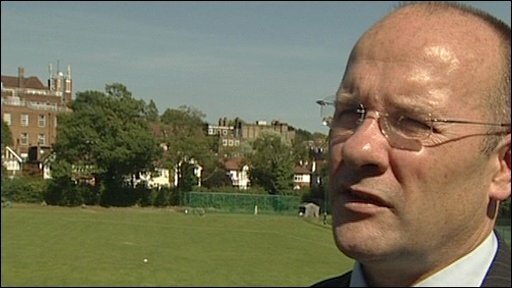 Former Harlequins rugby director Dean Richards has admitted he ordered the fake blood substitution of Tom Williams that led to his own three-year ban. But he insists he was not aware until eight days after the Heineken Cup tie with Leinster that Williams had his own lip cut to cover up the fabrication. Richards then decided to orchestrate a cover-up to protect the "professional position" of those involved. Quins were fined £260,000, and Williams had his ban cut from 12 to four months. Richards, 46, says he has yet to decide whether he will appeal against the European Rugby Cup disciplinary panel's ban from coaching in European competitions, which was extended by the International Rugby Board to apply worldwide. "I have always been passionate about rugby and in the dying minutes of that Heineken Cup quarter-final - a stage Harlequins had never reached before - I allowed my passion for the club to compromise my judgment," he said. "I ordered a blood substitution to be made using fake blood," said Richards. "Thankfully the substitution did not affect the outcome of the game. "Some eight days later I was told by Tom Williams that, in the heat of the moment and at his direction, he had his lip cut to make it appear as if there had been a real injury if anyone asked to look at it. "Believing this to be true, I felt a managerial duty and sense of loyalty to safeguard the professional position of those involved. "From then on, with the agreement of Tom Williams, I suggested the fabrication of a story which led to us all withholding the true facts, a position that was obviously wrong. "I have since made clear that I accept full responsibility for what happened and have apologised for my actions. I honestly believed that I was acting in the best interests of the club and my colleagues, a clearly mistaken belief. 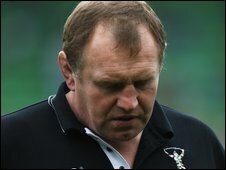 "I am mortified that this matter has brought damaging publicity on Harlequins, members of its staff, my own family and the wider game of rugby." Richards also said that on Monday, 3 August, he tendered his resignation to club chief executive Mark Evans but it was not accepted until 8 August. Evans said on Wednesday he expects a change to the regulations for blood injuries in the future. "I think independent doctors on the sidelines are inevitable," he admitted. "That would clear up all the blood issues pretty quickly and it is a fairly low-cost solution." The club's review into the incident is continuing but Evans revealed the club will introduce a "whistle-blowing policy" to ensure there is no repeat and has warned that the sport as a whole needs to learn from the episode. "Nobody at Quins is trying to duck the fact we have made huge errors and made mistakes and it shouldn't have happened and we have to apologise for that," he insisted. "One of the things this has shown to me is that some of the systems and the processes we have on the corporate side of rugby just weren't adequate for this. "We have got to get ourselves sorted out. You can never guarantee you won't have something happen again - but we can guarantee that if it does we will have much better processes in place to deal with it. "We have to do that because we never want to go through something like that again."